Mines Franklin, whats yours ? That one NPC that Trevor punches outside of Franklin's house. Ha! Love the Trevor bully video. I've clearly not done enough of that! 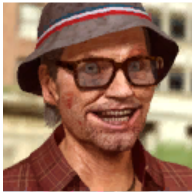 Franklin Clinton is my favorite one as I found it a cool guy in the game. Other than this one I also like Trevor in the game.